I can't imagine a nicer setting or a more pleasing promenade - in part because of the storybook colors. This reminds me of "La Grande Jatte" painting by Seurat. Lovely postcard, makes me want to go to the boardwalk. That´s really nice, hi hi. Aber die super- Tupper- Karte ist die allerbeste. Very nice. Wished I was there. 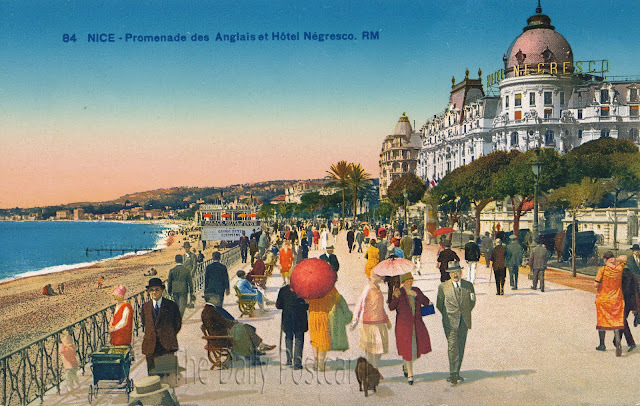 Negresco, born in Romania..."The Hotel Negresco on the Promenade des Anglais on the Baie des Anges in Nice, France was named for Henri Negresco (1868–1920) who had the palatial hotel constructed in 1912. In keeping with the conventions of the times, when the Negresco first opened in 1913 its front opened facing the Mediterranean sea. Henri Negresco, born the son of an innkeeper in Bucharest, Romania, left home at the age of 15 going first to Paris then to the French Riviera where he became very successful. As director of the Municipal Casino in Nice, he had the idea to build a sumptuous hotel of quality that would attract the wealthiest of clients. After arranging the financing, he hired architect Édouard-Jean Niermans fr:Édouard-Jean Niermans to design the hotel with Gustave Eiffel reportedly commissioned to do its now famous pink dome. The spectacular Baccarat 16,309-crystal chandelier in the Negresco's lobby was commissioned by Czar Nicholas II, who due to the October revolution was unable to take delivery." Those colors great for sure! What a wonderful view of the boardwalk there. It is a great, colorful card. Only the people who changing in Nice, not the place. One of the greatest place for me in Europe. And a postcard is amaaaazing! Great colors and a cute, fat dog! The colors are unrivaled! Wow. Need to blow that one up to frame. A heartfelt thanks and farewell to my readers. My last post (the thousand and first!) will be on November 7, 2012. The blog will remain online, but there won't be any new posts as I need to make time for other things. There is a chance I'll be back, but if so it won't be for awhile. I hope you'll take the time to peruse the archives. 1. Enter a search word or phrase in the box below - anything from Princess Grace to Prohibition or Graf Zeppelin. 3. You can also go through the archives by date. Just click on the triangle next to the year or month to open the list. 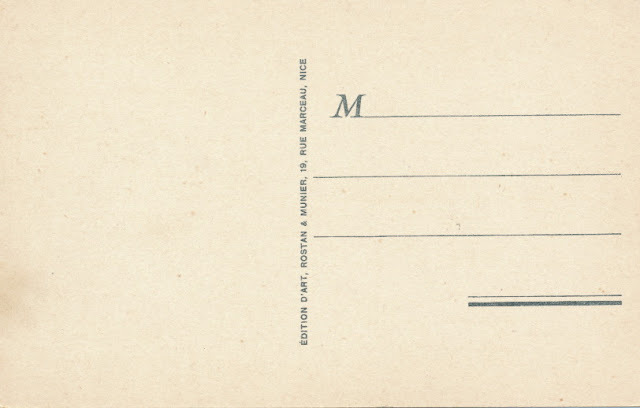 I love antique postcards because they preserve evidence of everyday life as well as celebrations and sad events. 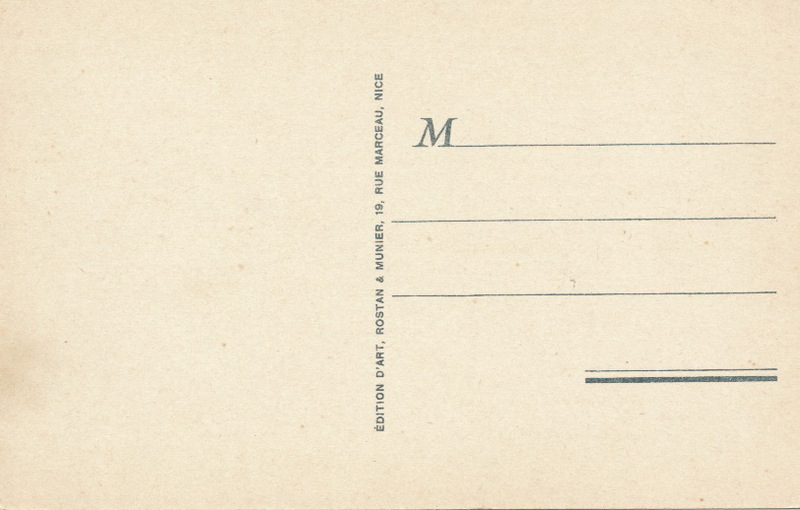 Looking at an old postcard is like holding a single piece of a puzzle; we have to imagine the rest. I will try to put up a postcard every day. If you have a special request for a particular city or place, let me know! If I have missed your link in these lists, please let me know.